Once you have attained or designed atrading strategy, acquiring a very good understanding of money management in your trading will become extremely important in determining just how successful you become as a trader. But what is money management? Money management is an asset protection tool that involves calculating just how much you should wisely risk per trade. In fact, experts typically suggest that learning to apply well-tested money management techniques is more vital to trading success than developing your trading strategy. Your top priority as a trader is to always protect your equity, because without it, you will not be able to play the Forex game (or any other market) any further – unless you constantly replenish your account balance. This should be avoided at all cost, which is why you should learn how to apply the concepts of money management effectively in your own trading. However, human nature prompts most beginners to focus on profits instead of concentrating initially on potential losses. In addition, many novices harbor a serious psychological flaw in believing that all their trades will be winners. Consequently, they are completely unprepared to cope with the ravages of live trading. Since the trading game is inherently complex, losses are inevitable. Successful traders are those that master the skills of restricting their losses by controlling them properly. This is the prime reason for developing a sound money management policy, which is a strategy enabling you maximize your profit potential at minimum risk. Many experts recommend that novices should initially adopt a simple money management strategy, suggesting they never risk more than a pre-determined fixed amount of their total account balance on any single position. In particular, 2% or less is the maximum recommended. I personally risk only 1% per trade these days. Risk exposure per trade can be kept within this specification by correctly calculating the stop loss and position size of each position opened. Stop loss specifies the number of pips that will be risked per trade, while position size represents the size of the trade expressed in lots. Note: One tool that I have found very useful is the position size calculator at Earn Forex. Simply input your current account size, the amount you’re willing to risk (1% – 2% if you’re wise), the amount of pips from your planned entry to your planned stop loss, and finally, what currency you plan to trade. The calculator will give you the correct position size to use, among other data. By doing this, you can be sure that you’re consistently risking the same small percentage of your account on each trade. You can acquire a better appreciation for the logic behind such an approach, once you understand that there is a significant difference between risking 2% of your total equity and risking 10% of it on each trade. For instance, if you risked just 2% per trade, then you would lose nearly 17% of your total equity should you be unfortunate enough to endure ten consecutive losses. 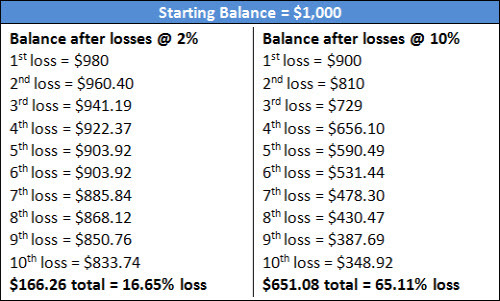 Under identical conditions, you would suffer losses of more than 65%, if you risked 10% of your account per trade (see the illustration below). After studying this example, you can conclude that using a lower level of risk per trade will certainly help optimize the protection of your equity. There’s no question why so many experts stress the importance of risking just a small percentage of a total account balance per position; periods of drawdown (consecutive losses) are inevitable in trading. By mastering money management in your own trading, you will greatly improve your chances of advancing your trading skills and knowledge in small steps of incremental risk, while ensuring maximum protection for your account balance. If you risk too large a proportion of your total equity per trade, you may not receive the full benefits of your trading system’s positive performance – given the inevitable periods of drawdown in every trading strategy, and assuming you have a trading system that is profitable in the long term. Forex trading (or any trading) is really about speculation, and speculation is all about uncertainty. What this means to a trader is that you only have full control of your own account balance until the moment you activate a new trading position. After that moment, price rules the day; meaning that you will never know with 100% certainty whether your trade will eventually record a profit or loss. However, you do have the control to determine, by mastering money management trading strategies, the maximum loss you could suffer should price turn against your open position(s). In conclusion, I’ll answer this question succinctly: What is money management? Money management is simply a wise allocation of your trading capital. It is a set of rules to apply to your trading that limits the hit to your trading account balance when your trading plan inevitably fails.